As I have referred to in a previous post, I went to 1d4con last week, for the first time, in Martinsburg, WV. I had a great time! But we’ll get to that. I got there Saturday, played Cthulhu Wars, OGRE six, and on Sunday, I really wanted to try out a game that I had noticed before and actually downloaded the PDF (for a nominal price). 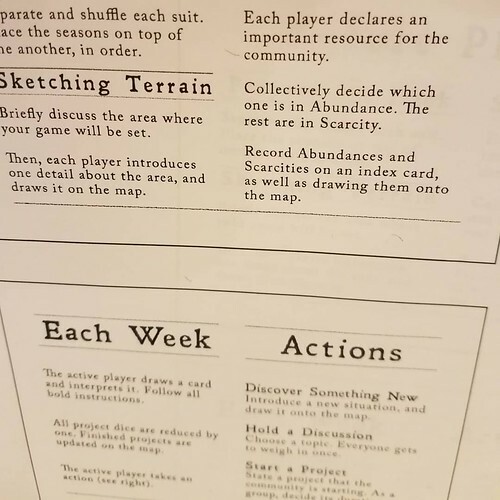 This is a small “map game” (as the designer terms it) called THE QUIET YEAR, published by Buried Without Ceremony press, designer Avery Adler. The premise and execution of The Quiet Year are deceptively simple. Roughly speaking, this is a cooperative game about building a community for long term survival. Components are also deceptively simple.. you aren’t playing a character in a dungeon or anything remotely like it, so it’s pretty innovative as a “roleplaying game”, at least based on this oldster’s experience. Instead you are given a narrative premise, which is always the same– some form of apocalypse has happened. Your community was in a conflict with the Jackals (who are not explained) and have about one year of relative peace before some big unexplained baddy called the The Frost Shepherds are expected (which ends the game). What will you do to keep the community alive? The Rules, such as they are. Each person can Hold a Discussion, Start a Project, or Discover Something New.. all of which are “told”.. no dice are rolled. The standard narrative is read aloud, from the small booklet that comprises “the rules”. Rules is a descriptor that doesn’t seem to fit here; Almost 100% of this game is played through talking– and there are very few limitations on that. In general, a turn proceeds around the table. You have a blank piece of paper in front of you that becomes the map. Each of you has a small pile of tiny dice to represent projects– since projects take time to complete the dice are a great visual marker of the passage of time, week by week, until a project completes. Note, you don’t roll those dice.. they are just there to be project clocks. Our Guantanamo Bay Colony, with rusty ship sunk on the docks, remnants of the old prison, my tree farm project (bottom left) the agricultural attempts (blue dice with a 1 showing), Zombie weaponization project (green dice with a 2 showing), forging recycled scrap from the shipwreck (yellow 2) and establishing a new trade route with Capitano Rodriguez (red 1 showing). The real fun is the map itself. You start with a generalized idea of where and when you are and what you want to accomplish. Then you take a blank piece of paper and start drawing. 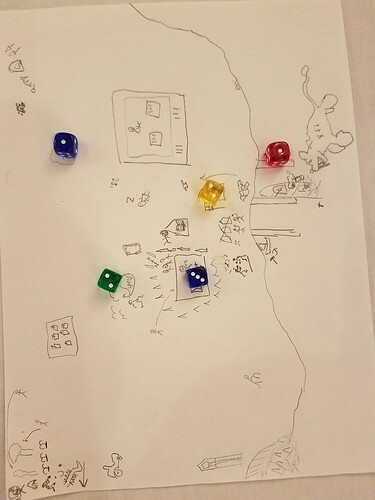 Each player draws one feature on the map and passes it around. Then the game starts in earnest. 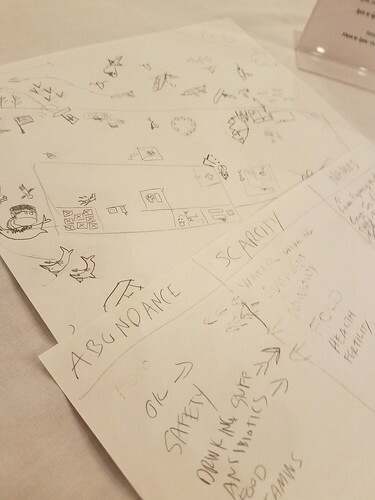 As turns progress, more and more is marked on the map– each turn the players introduce story concepts and new characters and challenges.. even ones that harm the colony. For instance, in the map above, there is a zombie outbreak in the old army barracks. The zombies become a major plot point. There is some form of mutant sea lion that is raiding food supplies and killing people (in the water). There is a tribe of cannibals to our Southwest, which become another major plot point as spies are sent there and found beheaded at our perimeter. The passage of time is measured by the Seasons deck. Each player starts his or her turn by turning one of these over and reading the event on the card. 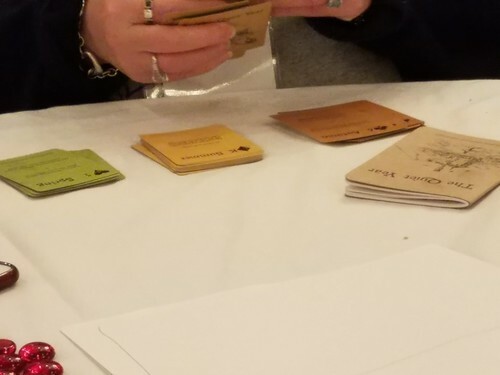 The player who turns the card must, to the best of their ability, work out the events on the card and invent a new plot point to fit the card. For instance, I drew “one of your projects fails spectacularly. Which one? What caused the failure?” At the time that card was drawn we had sent one of our people over to the nearby village to see more details about the new tribe we detected to our SW. I had to choose one ongoing project to fail, so I chose the spy mission. In my narrative, the spy’s head was found in our perimeter one morning, perched on a small cairn of rocks. The passage of time is drawn from a prepared deck of cards– the seasons deck is arranged so that Spring, Summer and Fall have active cards and I think there are relatively few Winter cards. Once someone draws the card: “The Frost Shepherds show up”, the game ends. That’s it, that’s all there is. Abundance, Scarcity and Names are they only things that really change, and I get the feeling the GM just does this to remember things. The thing is, this is a ton of fun. I’m pretty inexperienced as an Indie RPG player, but I have tons of what we now call “Conventional RPG” experience. I’ve never played the narrative games like Vampire or its ilk, although I have played Fiasco once or twice. So open-ended games where there’s no experience points, no leveling up, nothing to gain from your session except the quiet satisfaction that you did a pretty good job is kind of new to me, and actually quite satisfying. Our Guantanamo Bay project had everything going wrong with it at first– zombies in the barracks, no sustainable food, the island was losing timber quickly. I found myself actually identifying with these nameless, conceptual people, and caring if my colony lived or died. When a fellow colonist desired to clear cut all the trees on the island, I jumped in to passionately argue for creating a sustainable tree farm so that we would have timber forever, not just this year. When I introduced “Capitano Rodriguez” a Portuguese coastal trader who sailed around the islands trading for food and goods, my fellow colonists wanted to capture him and his ship since it attracted sea marauders. I argued against it, since it was yet another source of sustainable food for the colony.. “this is an island” I complained.. “there won’t be MORE land to farm.. we have to work expanding our food sources.. not just for this year, but for next year..” They came around, and let him go after we helped fix his boat. It’s fun how caught up you get in this stuff. The GM was quite good and understood this system perfectly. She kept the discussion focused and kept us steering by the minimal rule set. One of the players had played it before and was responsible adding some really fun and Machiavellian plot lines– like the social divide between the descendants of the soldiers who used to staff Guantanamo and the “newcomers” who were looked down upon them. I added the additions of the cannibal tribe, the slightly more advanced island that traded with Sea Rovers, and the idea of sustainable tree farms and harvesting scrap metal. Our GM was very complimentary about our efforts to keep the colony alive. I really enjoyed this low concept RPG, and I’d certainly play it again. Next 1D4Con AAR and OGRE 6! Unfortunately for me, I don’t have anyone around to play something like this with. Brian, It would seem to me that you could play this game via Google Talk or rolld20 (I think that’s what its called) very easily. It requires virtually nothing by way of components. I’d gladly try something like that. I’ve never tried either of those things. I’ll look into it. Thanks!